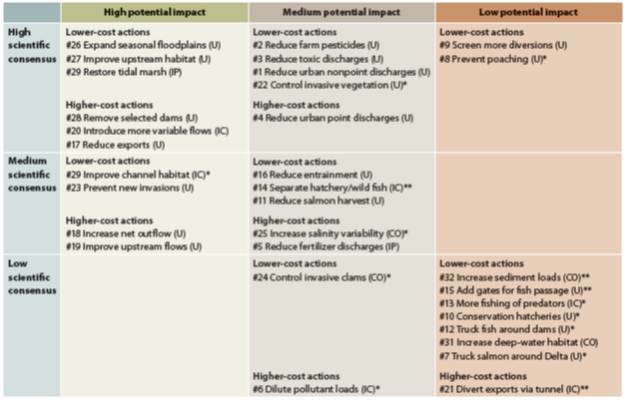 The latest PPIC Delta report includes the results of an interesting survey of scientists and stakeholders on options to improve the Delta ecosystem. Looking at the key table of findings (table 2, page 14), the tunnels are down in the bottom right of the PPIC table, low potential impact for fish, low scientific consensus, and high cost. It is the worse possible outcome in this ranking (upper left quadrant is best, lower right is worst). Nevertheless, the PPIC calls the BDCP "promising" even though it is completely focused on the lowest ranking, most controversial option, and unnecessarily ties many of the more valuable, less costly, and less controversial habitat measures into a package with the tunnels. As I have stated repeatedly, the ESA does not require the tunnels! The state can and should develop strong no-tunnel options for the BDCP. Although the tunnels fared terribly in their survey, the PPIC does not highlight that conclusion. Instead they offer reasons they think the tunnels are better than they look in this ranking. For instance, they talk about how the measures interact with one another, but they do so in a biased way - pointing out how the tunnels might support some measures while omitting how they work against other measures. For example, on page 14, they state "If managed for conservation objectives, a tunnel could facilitate more variable flow patterns (#20) and reduce entrainment (#16)—two actions scientists consider quite promising." What is the offsetting factor that they leave out? The tunnels conflict strongly with the strategy of reduced exports (#17) which was also one of the highest ranking options for effectivness. Their study finds that reducing exports has both higher environmental benefits and lower costs than the tunnels, thus I find it strange that they keep advocating the tunnels over reduced export strategies. It is clear that exports will not be reduced with the tunnels, and will likely be increased from current levels. 1. Water exporters received, by far, the lowest grade for scientific knowledge of any of the stakeholder groups. They even got a negative score for 2 out of 3 categories! At least the Delta folks got a passing grade. Table 7 from this supporting report has the results. 2. The cost of the tunnels are only $$$! Why did they use these 3 cost ranges with symbols? , $, under $10m annually, $$, 10m - $99m annually, and $$$, is $100m or more. Why didn't they put numbers for the estimated cost ranges in the table? And if they are going to use symbols, they must have a consistent meaning. This is the kind of PR garbage that professors routinely mock in the first week of statistics. It makes it look like the cost of the tunnels are not that high, even though they are orders of magnitude higher than measures that received the same symbolic rating. It is reminiscent of the early BDCP screening studies I criticized for their biased, pro-tunnel analysis. See this old post, "Would BDCP staff accept dots instead of dollars in their paychecks?" It looks like the Kings' are staying in Sacramento. I had been putting the odds of that as 1 in 3, so I view the announcement of the NBA committees unanimous recommendation to vote against moving the francise as a bit of an upset. Although it has been a painful year of uncertainty, it looks like things may work out significantly better for Sacramento because the Maloofs' backed out of the original deal. In Fall 2012, BDCP announced it was finally going to do a statewide benefit-cost analysis after refusing for years. The framework and preliminary results from some components were described by Dr. David Sunding in BDCP Finance Working Group Meetings in November and January that I attended, and a scope of work was released. While I was initially encouraged, it became clear in these meetings that BDCP was not going to allow Dr. Sunding the freedom to do a correct and comprehensive benefit-cost analysis. I submitted comments at the requested deadline that said BDCP should stop saying they are doing a benefit-cost analysis since they are not following the guidelines established by their own agencies. BDCP Chapter 8: Costs and funding sources. Notably, they say this will still not be a complete financing plan. Alternatives to Take: This sounds like it could include some interesting new analysis but details are murky. It is described as an economic feasibility analysis to undefined alternatives to take which are said to be different than the alternatives in the EIR. Economic benefits of the proposed project to participating water agencies. This will be an update and detailed technical report of the informative, but narrow one-sided analysis Dr. Sunding has already presented at several meetings. Statewide Economic Impact Study: This sounds more useful than it is. It will look at economic impacts on some stakeholder groups who oppose BDCP, like Delta farmers, but is not nearly as balanced as it sounds. It will likely generate some useful information, but like most economic impact reports, it will lend itself to distorted interpretations and generate lots of talking points for PR flaks. Notably, it does not seem to include any estimate of the economic impacts of higher water rates on consumer spending and industrial activity or the economic impact of diverting dollars from the state general fund to pay the water bond. Employment Impacts of BDCP: This was already released and is being used for pro-BDCP talking points. What the pro-BDCP PR flaks who write these memos aren't pointing out is that the 137,000 job years over 50 years for over $20 billion in public spending over that period is actually pathetically weak job creation. It is roughly 6 jobs per $1 million in public spending which is about the worst job bang for the buck I have ever seen. Most public works programs create 10-20 jobs per $1 million. BDCP alternatives will undoubtedly create more jobs. Socioeconomic Impact from the Environmental Impact Report (EIR): Nothing new here, a required part of the EIR. By examining the costs of BDCP in Chapter 8, the benefits of BDCP to the participating agencies in the contractor benefits study, and the economic impacts of BDCP on other affected parties in the statewide economic impact study, the public can determine whether the BDCP is a good investment for California. While that may sound democratic and inclusive, and is more accurate than mislabeling their reports as benefit-cost analysis, I am sure the public and the legislature would appreciate it if they would let their esteemed professor interpret his own studies in a comprehensive benefit-cost analysis, and defend it in independent peer review. I haven't talked with Dr. Sunding in quite a while, but think I know him well enough to guess that he would prefer that too. Instead, we will have Jerry Meral and the pro-BDCP flaks helping the public interpret his work. As an antidote to the spin, I recommend the public read my preliminary benefit-cost white paper from last summer. Using BDCP's own numbers, I concluded the benefits fell $7 billion short of the costs. I will update it if these new and revised studies yield new information, but preliminary results revealed to date do not show a huge difference. There still are some problems with the definition of BDCP alternatives in these studies. Although it sounds like they have made some improvements and are going to look at something resembling the small-tunnel "portfolio" plan, they also appear to be continuing to ignore the seismic levee upgrade alternatives. And thus the BDCP that makes a big deal about natural disasters in the Delta will continue to ignore a lower-cost alternative that addresses the co-equal goals while creating the additional benefits of saving hundreds of lives in the event of an earthquake, in addition to protection of the billions of dollars in private property, transportation and energy infrastructure damage that will receive no protection from the BDCP. The results of the BDCP studies will depend a lot on what they assume as the "no action" or no-tunnel alternative in terms of water supply and flood protection. One can't help but wonder what prompted the cancellation of the benefit-cost analysis just a few weeks before it was supposed to be released in final form. I went back to the scope of work of the purported benefit-cost analysis and made note of the descriptions of Task 3, due in late March or early April, and Task 4 due in mid-May. methods used, the results, and draws overall conclusions about the cost and economic benefit of BDCP. This final section will offer an opinion about whether benefits exceed costs from a statewide perspective, and over what time frame. The concluding section will also summarize the impacts in various regions of California, and to various interest groups. The draft technical report will be submitted for review by the California Department of Water Resources (DWR), Reclamation, and the water contractors involved in the BDCP. Task 4. Prepare Final Technical Report Based on comments received on the draft, the Contractor and Brattle Group will revise the technical report and prepare a final report suitable for public distribution and web posting. Perhaps cancelling the benefit-cost analysis report in favor of this release of a hodge podge of mini-studies was the revision ordered for Task 4. Update 4/24: I added a bullet list of the 6 studies with brief comments, and deleted a reference to the $23 billion BDCP that caused some confusion. The $23 billion came from a 2012 estimate of $14b tunnel construction, $4b habitat construction, $5b operation and maintenance costs over 50 years. Some had misinterpreted that I was saying that building the tunnels would cost $23 billion. A few other minor edits too. After a dry winter, it's looking like another tough year for Westlands Water District. The latest CVP allocation announcement was 20%, and like the 2009 drought, it has brought out claims of economic loss. The claims of loss are higher than were experienced with the 10% allocation in 2009, so on the surface they would appear to be exagerrated. For example, Westlands General Manager Tom Birmingham says Westlands farmers alone will lose $350 million in revenue, and total economic impact will exceed $1 billion. In this letter (that I only read thanks to Mark Borba's infamous rant), Congressman Costa says there will be agricultural production losses in the San Joaquin Valley of $873 million and economic impacts of $2.2 billion. Neither statement reveals the source of the numbers. The Westlands website (which to their credit, provides nice data) includes a page with historic water supplies and fallowing, and includes a prediction of 2013. Their forecast for 2013 is for an all-time high of 175,000 fallowed acres. That's 20,000 acres of fallowing more than in 2009, when they had 100,000 af less water. That doesn't seem right, but maybe there is a logical explanation for it (if you know why, or have a plausible explanation, feel free to put it in the comments). I created some simple regression models this afternoon, and got forecasts ranging from 113,000 to 120,000 acres of fallowing for Westlands in 2013. If I use my prediction of 120,000 acres of fallowing instead of their predicted 175,000 acres, what is the economic loss. Baseline fallowing in a wet year is about 60,000 acres, so my prediction is that about 60,000 acres more out of production in 2013 compared to a wet year. Of that 60,000, no more than about 20,000 could be reasonably blamed on environmental restrictions, the rest is due to the dry weather. Across the entire San Joaquin Valley, I think a reasonable estimate would be $100-150 million in revenue losses and about 2,000 jobs due to the biological opinions in 2013. That's a real economic impact that shouldn't be ignored, but it is about 85% less than claimed by Mr. Birmingham and Congressman Costa. What Should We Assume About New Technology in California Water Policy? 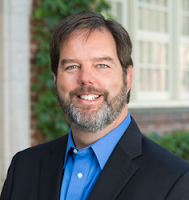 When we talk water in our Center at Pacific, my colleague Dr. Pogue always brings up the lack of emphasis on new technology in California water debates, and the assumption of constant technology that undergirds virtually all economic and planning studies. Dr. Pogue's PhD is in the economics of technological change, and I should listen to his advice more. But I am as guilty as anyone in making conservative technology assumptions, as I don't want to be accused of making unrealistic assumptions to tilt an analysis. However, California water policy is driven with built in expectations of sea-level rise, changing precipitation and levee-exploding earthquakes. We accept those assumptions, but not assumptions about advancing technology. I am confident that we will have game-changing technological advances concurrent with if not before any of those climate change and natural disaster impacts hit California water in a large way, and I am certain we would if our policies did more to encourage these technological advances. If water policy analysis is going to assume 18 or more inches of sea-level rise by 2050 and a 2/3 chance of levee destroying earthquake by 2050, it seems realistic to also assume that the real cost of alternative water supplies, including desaliniation, will drop by half or more in the same time frame. In fact, last month, Lockheed Martin acheived a patent for Perforene, a carbon membrane the width of a single molecule that promises to reduce the energy requirements of desalination by one-hundred times. we believe that this simple and affordable solution will be a game-changer for the industry,” said Dr. Ray O. Johnson, senior vice president and chief technology officer of Lockheed Martin...At only one atom thick, graphene is both strong and durable, making it more effective at sea water desalination at a fraction of the cost of industry-standard reverse osmosis systems. But that isn't the only new desalination technology on the horizon. In the past year, Lawrence Livermore National Lab has been touting its own technological breakthrough, flow-through electrode capacitive desalination. They have a prototype and patent application pending, and are seeking industrial partners to help it bring the technology to market. LLNL has developed an innovative technology that promises to unlock an almost inexhaustible water source for U.S. and global population markets. And they aren't the only ones working on new desalination technologies, and more advances continue in water efficiency, recycling, and stormwater capture. Now that we have reached the point where two highly credible sources like LLNL and Lockheed Martin are a few years from bringing important new technology to the market, I think it is time to more explicitly embrace technological innovation in California water planning and policy. If California were to focus more on these types of technological breakthroughs, we would not only be solving our own water problems but helping to solve a critical present and even greater future problem in poor, developing countries. We could develop technologies and advanced manufacturing here, and sell to a global market. Instead, California water policy is fixated on a pair of $14+ billion concrete tunnels, where an estimated $3 billion of the total will be spent on foreign tunneling machines and plumbing components. It seems so last century and unCalifornia to me. This is the state that funds stem cell research, that has moved ahead with cap-and-trade and supported alternative energy supplies, and has the most innovative technology center in the world in Silicon Valley. What if it became a goal of state policy to shut-down the state water project pumps over the Tehachapi mountains in 20 years? What if both southern California and Silicon Valley were to stop importing water from the Delta. It sounds less crazy to me than past technology goals like putting a man on the moon, or current California policy goals like bringing carbon dioxide emissions down to 1990 levels by 2020. Unlike the current Delta plan, developing these water supplies would actually increase the state's water supply, and pumping less over the mountains would make more low-cost water available for San Joaquin Valley agriculture as well as support higher outflows for fish. Developing these alternative water supplies would create thousands of jobs in California, save energy, and foster the development of new California industries to sell water technology around the globe. The only loser would be the Metropolitan Water District (the agency itself, their customers would benefit), and therein lies a major problem. The only way to finance the collosal debt of the Delta tunnels will be to keep southern California and silicon valley dependent on Delta water. I have heard people say the state should do the BDCP and develop advanced water technologies and alternative supplies, but the two visions are fundamentally in conflict. I have a lot of respect for Paul Krugman as an economist, and I have spent many hours defending him and explaining him to business people. However, his commentary on California published yesterday was not very good. Below is a graph of California per capita personal income as a percentage of U.S. per capita personal income. The 2012 data was released last week, but has not been updated in this graph. It showed that California per cap income held steady at 105% of U.S. per capita income in 2012. Hardly a comeback story. This graph does not account for the changes in the cost of living. According to the CPI, since the 1982-84=100 benchmark, the CPI increased by 5% more in major California metro areas than the rest of the U.S. over the past 30 years. Thus, if this graph were recreated as real personal income, California real per capita personal income dropped from 115% of the U.S. average to even in a generation. There are some disturbing signs for the future too. Education worries me the most. Levels of education for Californians under 35 are not great, and education funding in the state has gone from good to very low by any measure. The relative high skills and education level of California's workforce is skewed upwards by the older population which is not the workforce of the future.